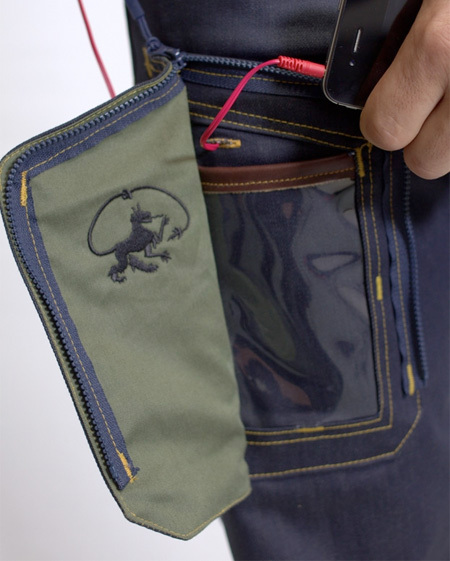 Stylish pants designed by Alphyn Industries are equipped with transparent pocket that provides quick access to your smartphone. 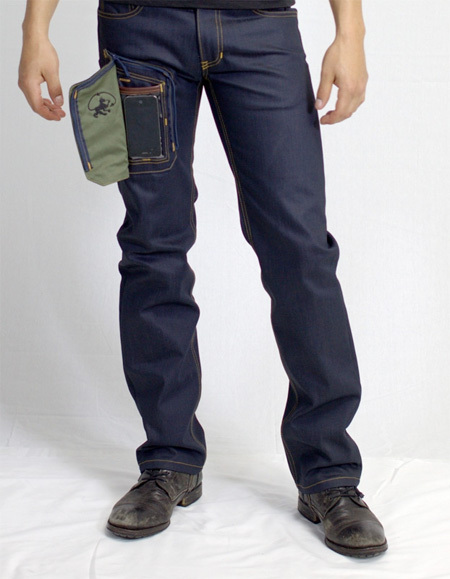 Inspired by military clothing, DELTA415 Wearcom jeans give the wearer the ability to use their phone without having to take it out. 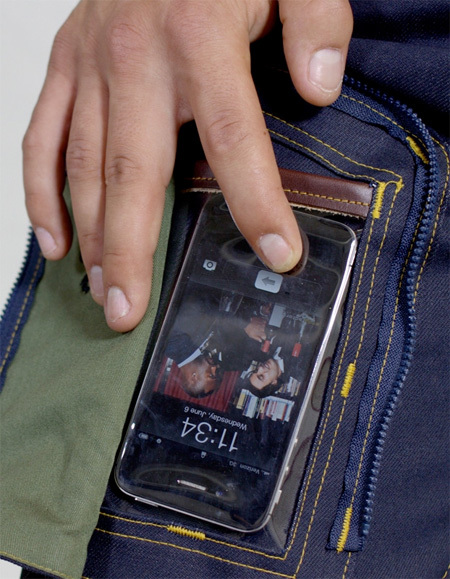 Useful pocket made out of innovative material allows complete interactivity with iPhone, Android, and other touchscreen devices. A complete fail on so many levels. This bring laziness to the whole new level. Man, that pistol outline really makes this design badass. I would put a big stack of money in there instead of my iPhone and zip it open whenever I talk to a girl at the bar. This will make me look like a stud. How do you get your ear down low enough to hear the person when making a call. Ben, they’re especially made for contortionists. Kind of cool. Of course, you’d need earphones with a mic in order to make calls, but pretty cool. You don’t even need to take your phone out to use it, since the vinyl is touch-sensitive or electro-conductive (I forget the correct term). I think this is futuristic. As we become more dependent on having our electronic devices with us at all times, we need places on our bodies to store them. 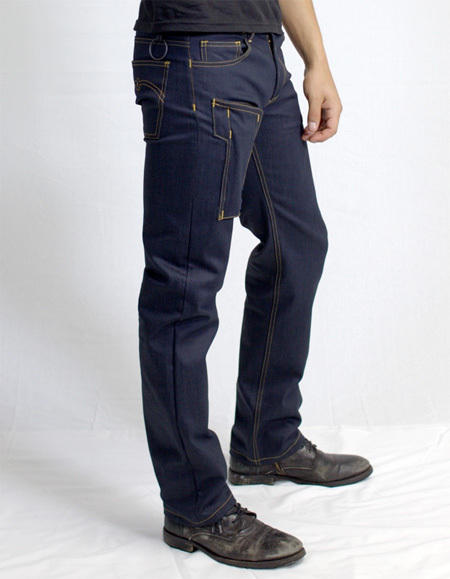 I say better to design new fangled pockets in our clothing than stored in our teeth or under our skin–which you know is only a matter of time. perfect for the classes where you arent allowed to have your phone out! This is a great idea to bring the iphone with a bluetooth, especially in environments like the train of NY or London. If you want to play, get tired, but to move without worrying about anything is great. If you do not ask people for emergency construction or how useful it can be. Greetings from Madrid. hummm pants could be cutest! 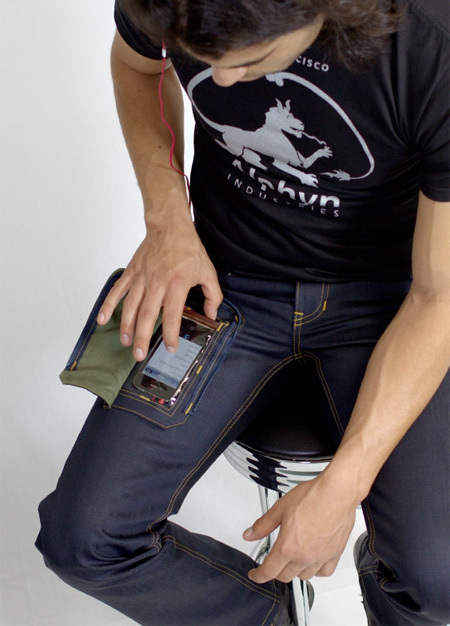 So basically it’s become too lazy now to take out your ipod to change the song or whatever, that now we have a type of jean which can store it? Just crap design which is pointless…. for lazy people and people who have too much spare time. Simple change, just take the dam ipod out to change the song then put it back in. simple. he looks so happy with those pants! 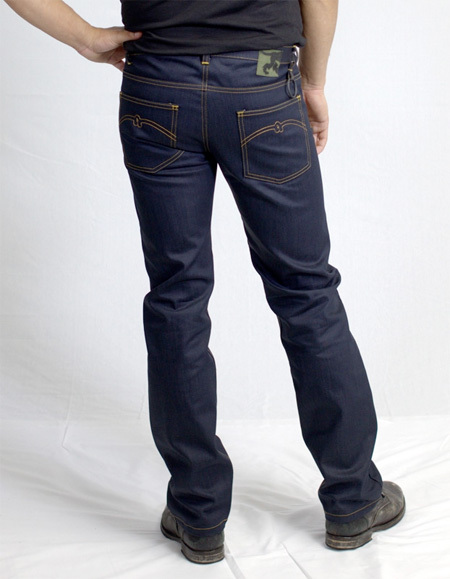 And these jeans were born. Besides all the negative feedback from the website visitors, I think it’s pretty cool and practical. I would love to have one. Every time I go out I just don’t know what to do with my cellphone/music player. You can’t sit in taxi comfortably with something like this in your pocket, let alone being able to reach it! I agree with Payaam, if Im sitting down in the car, i cannot for the life of me get it out of my pocket, and when its out of my pocket it slides around the car and is hard to change the song.